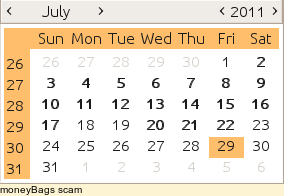 We got this email (below) this week assuring us that July 2011 is the special event of a month with 5 Fridays, 5 Saturdays and 5 Sundays. So the tale goes, this only happens once in 823 years. "The proverb goes that if you send this to eight good friends money will Appear in next four days as it is explained in Chinese FENG SHUI." Sure sounds like a hoax email, but the subject is fascinating. I created a quick UNIX Bash shell script to hunt for such months between 1970 and 2037 (the range of dates that UNIX/Linux can handle at present). The answer is 67 times in 68 years! Not so special after all. Here is a text file with the relevant months A quick google search showed this is listed on several common hoax-busting sites, eg, snopes, hoax-slayer. Kinda interesting - read on!!! The results will be 111 for everyone in whole world. This is the year of The Money!!! This year October will have 5 Saturdays, 5 Sundays, 5 Mondays. This happens every 823 years..... These particular years are known as "Money Bags"
The proverb goes that if you send this to eight good friends money will Appear in next four days as it is explained in Chinese FENG SHUI.